This blog explains some frequently requested technical aspects of the acquisition and processing of weather data in my hobby weather station. The solution is based on the weather sensors KS 300 and S 300 and the USB Weather Data Receiver USB WDE1 from ELV. A small, ARM-based Linux computer like Linksys NSLU2 or Raspberry Pi acts as control computer. The USB Weather Data Receiver USB WDE1 receives data from diverse weather sensors from ELV wirelessly at 868 MHz. It is available there as a DIY kit and ready-made device. The receiver is connected to a USB port on the computer. This also delivers power, so no additional power supply is required. The data is transmitted via a simple serial ASCII protocol that has been well documented by ELV. This allows various experiments and creative self-made solutions! The old weather station based on the NSLU2 with external USB hub to control WDE-1, 1-wire bus and air pressure sensor. The new solution with Raspberry Pi (picture top left) integrates everything into a single housing. 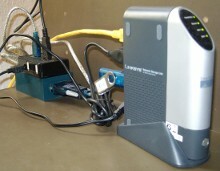 The data acquisition computer - a NSLU2 with Debian GNU/Linux 5.0 (Lenny) - was doing their service five years without complaint. The NSLU2 has two USB ports. At one is plugged a 2GB USB flash drive containing the operating system and data. The other USB port is extended by a USB hub to connect multiple USB devices. One of them is the USB WDE1. I have repelaced the NSLU2 by the end of 2013 with a Raspberry Pi Model B. It also has two USB ports, but both are freely available because the operating system is located on an extra memory card. The following comments apply to both hardware equipments, the software could be transferred from the the NSLU2 to the Raspberry Pi without modifications. The udev subsystem should then also create a corresponding device file, usually /dev/ttyUSB0. This device behaves like a serial interface and can therefore be operated with any terminal program, such as minicom for example. If you have connected other USB-to-serial converters to the computer, the device may have another name, like /dev/ttyUSB1 or similar. It is important to set the baud rate to 9600 bit/s. Each row represents a complete data set, which consists of 25 semi-colon separated fields. The first three fields are invariable, then the temperature readings (°C) of eight sensors (for example S 300) follow and then the humidity values (%) of these eight sensors. After that come temperature (°C), humidity (%), wind speed (km/h), rainfall (rocker strokes) and rain sensor (0/1) values of the combination sensor KS 200 or KS 300. The last field with the constant value 0 indicates the end of the record. For a long-term weather data recording the records should be written into a database. The resulting amount of data, however, is immense when, for example, you would like to capture and store one record per minute over ten years. It is therefore appropriate to familiarize yourself some thoughts about a sensible limit of the amount of data according to the intended use case. So it is perhaps quite sufficient to store a record only every 15 minutes for a hobby use case. And after one year I have no interest in the exact temperature at a certain time of the day - daily average, minimum and maximum values are fine. The measurement is based on one average value for each quarter hour (900 seconds). This value is kept 10 days which are 4 * 24 * 10 = 960 samples per DataSource. After these 10 days, there is an automatic reduction of the data to one average, minimum, and maximum value per day. The retention time of the daily values is 10 years, that are 3600 samples per DataSource. The parameter --step 900 defines the basic data collection interval to 900 seconds (15 minutes). The definition of data sources (DS) follows - one for each sensor. The names of the DataSources are following the scheme tempsn for a temperature sensor and humsn for a humidity sensor with n = 1..9, the sensor number. The temperature range is limited to -40..50 °C. winds9 is the anemometer at the combined sensor and israins9 the rain sensor. All of these data sources are of type GAUGE, i.e., the measured value is stored in the database just as it has delivered the USB WDE1. Data source rains9 is interesting: This is the rain gauge. It is implemented in the form of a rocker who once teeters after the damming of a defined amount of water while counting up a counter. The WDE1 provides this count and thus a measure of the total rainfall since switching on the weather station. In general, however, one is interested in the amount of rain per time unit, i.e. per hour or per day. Therefore, the according DataSource is defined here with the type DERIVE, which performs automatic differentiation of the value after time. At the end is the definition of the Round Robin Archives (RRA), which are responsible for the actual data storage. The first definition specifies that 960 samples are stored undiluted, that is, with a step size of 1. The following three RRAs cause the storage of 3600 minimum, maximum and average values. The calculation of these three variables is carried out for each of 96 samples, which is exactly one day (96 * 900 seconds). Running the command creates the file weather.rrd which occupies just under 2 megabytes of disk space. The file size does not change, no matter how many records are inserted - after all it is a round-robin database! If an entire data set has arrived, rrdtool.update writes the processed data into the round robin database, which is located in the same directory as the script itself. This involves the computation of average and limit testing according to the rules specified when creating the database. The final break statement ends the loop and program. If one were to omit them, then the program remains in an endless loop and writes all incoming data immediately into the database. This can be fairly common, depending on the number of wireless sensors. If the database file is on an SD card or a USB memory stick, then you should note that these media only tolerate a certain number of write cycles. In addition, of course you have to monitor a constantly running program regularly and check if it has not been terminated by an error, and then restart it if required. This article covers only some aspects of my weather station. Not described are the barometer with the BMP085 and the 1-wire interface for temparature and air pressure - more on that elsewhere. Specifically, I would like to point out that the techniques described are only suitable for the hobby and private use.